An Alternative Pool Sanitizing System. Managing the use of Biguanide, in pool water!!! Biguanide (PHMB) is the generic name of some of the more popular non-chlorine, non-bromine chemical sanitizers used in pools: products such as Baquacil, Soft-Swim and Revacil. While it is a popular alternative to traditional chlorine sanitizers, it does have a host of shortcomings. Conversion requires the addition of chlorine. Sanitizing is a must, for proper pool water management and biguanide use can lead to the development of sanitizer-resistant microorganisms. Salt Chlorine generators are a better way to utilize chlorine, producing more controllable results. They eliminate the need to handle, measure or store chlorine products, while reducing buildup problems. An Electronic PockeTester Kit is a convenient way to monitor the salt level, as well the overall water chemistry. A ColorQ, all digital Water Tester can perform all of the common tests, while eliminating the color-matching and guesswork. With 10 models, performing up to 11 different test factors, one is right for every need. The Circulator is a replacement return jet fitting, that dramatically improves circulation, by creating a spiral return flow. Better circulation helps sanitizers work more effectively. The WaterLink SpinTouch Labs are the ultimate tester, doing up to 10 different water test factors, in just 1 minute. How to sanitize a pool without chlorine? Biguanide (PHMB) is the generic name of some of the more popular non-chlorine, non-bromine chemical sanitizers used in swimming pools: products such as Baquacil, Soft-Swim and Revacil. The main advantage is that no chlorine or bromine is required and there is little chemical odor. Biguanide is an effective bactericide and can replace chlorine or bromine, in that function. However, chlorine or bromine are also oxidizing agents that can destroy organic contamination: biguanide cannot destroy organic contamination and, therefore, concentrated hydrogen peroxide must be added to the swimming pool on a regular basis. A disadvantage of biguanide is the development of biguanide-resistant micro-organisms, after a few years of product usage. This usually takes the form of a pink slime or water mold and the only recommended treatment is the application of large amounts of chlorine and/or non-chlorine shock. This treatment destroys all of the biguanide present in the water. Restoration of the biguanide regimen can risk a return of the problem and, therefore, a permanent switch to chlorine or an alternative form of sanitation should be considered. The trick is in understanding that recurring water quality issues are a clear indication, that a switch to an alternative pool sanitizer is required, and not be talked into staying, with what could become an expensive course. If problems arise, refer to the Pool Problems Page, as a source of problem-solving information, broken down into various categories. Scroll down the page and click on the linked keywords, catch phrases or images, in the archived answers below, to access additional information, on that topic or product. ► Biguanide and Biguanide Shock Testing Made Easy? I have used a biguanide test kit with the dropper bottles and test strips. I can't say that I like or feel confident about having to match the colors. Is there any other way to do the testing? Thanks for the help. Good News!!! 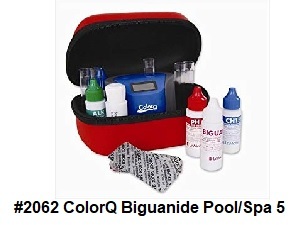 The ColorQ Biguanide POOL 5 Water Analyzer is an all-digital, hand-held tester that performs tests for biguanide, pH, total alkalinity, calcium hardness and biguanide shock. There are no colors to match and no look-up charts. It is an ideal tester for anyone with color matching difficulties. And it is affordably priced and easy to use. Seems to be just what you are looking for. I hope that this information will prove helpful. ► Wrong Way To Treat White Mold? 1. Cleaned the filter, sides, steps, skimmer, pool equipment & anything related to the pool. 2. Balanced pH, alkalinity, etc. I have put over 40 lbs, if not more of Shock in the pool and it still shows very little free chlorine. I'm not sure what to do next to get rid of the white mold. Should it really take this much shock? I did add some polymer algaecide and that stirred up some more of the mold from the bottom, but still didn't eradicate it. I'm frustrated and at a loss what to do. Any suggestions on how to totally get rid of this mess? Thank you. People use biguanide, because they don't want to use chlorine. You should not add chlorine to a biguanide pool, as it will destroy the biguanide and not the mold. A polymer algaecide's ingredient will register on the biguanide test, so you may not realize that you are depleting the biguanide level. This mold is typical, when the microorganisms have become resistant to the biguanide. It is almost inevitable and the best option is to switch to chlorine, on a permanent basis. A temporary switch will only leave the door open, for a recurrence. In the end, you depleted the biguanide level and did not add enough chlorine to eliminate the remaining biguanide and the mold, as well. The only time, that chlorine is used, in a biguanide pool, is to convert to chlorine or bromine. Conversion is simple. Add 4 gallons of liquid chlorine or 4 pounds of chlorine shock, for every 5,000 gallons of water. The chlorine will react with the biguanide and start to decompose it. As this happens the pool will go through cloudy and discolored states. This is normal. Periodically test the FREE CHLORINE level. You might have to repeat this dosage. Only after enough chlorine has been added, to register a stable FREE CHLORINE level, will enough have been added so as to destroy the biguanide, algae and debris. From this point on you should be able to maintain the chlorine level with normal product additions. During this time, adjust the pH, total alkalinity and a dd chlorine stabilizer. Instead of trying to avoid chlorine, why not use it in a better and easier way? If you are interested in maintaining the pool with chlorine and at the same time getting better water quality with less effort, you might look into a salt chlorine generator. It will give you most everything that biguanide could not. I hope that I have been helpful. If so, please tell your friends and dealers about the website. ► Using An Ultraviolet Sterilizer In A Biguanide Pool? Is an ultraviolet water sterilizer compatible with a biguanide pool? An Ultraviolet (UV) Sterilizer does not add chemicals to the water. There is no reason to suspect that it would have any negative effect on biguanide. What it will do is reduce the microbial populations, so that it becomes easier for biguanide to provide adequate sanitizing. You should still maintain the same chemistry, but you should find that the amount of biguanide required will be reduced. I hope that this information is helpful. I have a 24' above ground with an old DE filter that was clear about a month ago, but has been cloudy for the most part since. I used biguanide as the previous owner had but, after a week away, shocked the disgusting pool with chlorine-based shock treatment. It's been a couple of weeks since, and it's still cloudy although the readings for pH, biguanide and alkalinity seem to be in line. I wonder how well the filter is working. I put a cup of DE at the beginning of the day and backwash at the end. There is green in the backwash, but the pool is still cloudy overall. I need serious help. You have to make a decision! You can use chlorine or you can use biguanide - you can't use both. The effect of adding the chlorine was to destroy some of the biguanide. This by itself can cause the water to turn green. If you want to use biguanide, you must use hydrogen peroxide to shock the pool. If you want to use chlorine, you must add enough to completely destroy all of the biguanide and enough to deal with any algae. Conversion to chlorine will require about 4 gallons of liquid chlorine for each 5,000 gallons of water. The water will discolor. Check to make sure that there is free chlorine present and add additional shock, as might be required. Once the free chlorine level is established. the pool can be maintained in a typical manner. You seem to be operating the DE filter, as if it were a sand filter. It is not customary to add small amounts of DE to the skimmer. Either the DE has to be completely replaced, after the backwashing or the filter can be "bumped" and no additional DE is required. Consult a local dealer about your particular filter's requirements. Browse through the archives on biguanide and filtration problems for additional information. To better assure proper overall pool water chemistry, visit a pool store that has a very reliable, professional lab such as a WaterLink SpinTouch Lab, rather than a less accurate test kit or strip reader. I hope that I have been helpful. I have been using biguanide for the last 4-5 years with good results, at least until this year. I had a battle with water mold - whatever that is - and after spending a small fortune getting rid of it, it seems to be coming back again. What would you suggest? Thank you. Frustrated in Freehold. Water mold is caused by a microorganism that has unfortunately become resistant to the biguanide. In order to treat the problem, various chemicals such as chlorine shock or non-chlorine shock, have to be added to the water until a Free Chlorine level of 5-10 PPM is achieved. The water will go through various green-brown-cloudy stages, until finally the water clears up. It takes a lot of shock, at least 2 pounds per 5000 gallons, in order to complete the treatment. A consequence, of adding the shock, is the destruction of all of the biguanide. Resuming maintenance on biguanide will require that you start from scratch and this is why it has become so expensive. Once a biguanide-resistant microorganism has developed there is no guarantee that it will not return, even after successful treatment. For this reason, I suggest that an alternative sanitizer be considered: chlorine, bromine, ultraviolet sanitizers, Solar-Powered Dual-Ion Mineralizers, salt chlorine generators, ionization or a combination. Otherwise, you just might get the problem back, in spite of your best efforts. I hope that I have been helpful. Good luck. ► Not A Happy Camper? I am tempted to put a sledge hammer to the side of the pool and just start using a "cool" bathtub! Hope you can help: first off Alan, I use and have used biguanide in my pool for the past 5 years or so and have never encountered a problem. This year however was nothing short of a nightmare. When I pulled the cover off in May, I had brown, green cloudy water, a few bags of non chlorine shock and a week of filtering took care of the green brown issue and slightly helped the cloudiness. I then balanced my pool with 15 lbs. of calcium hardness, alkalinity increaser etc. I also got my biguanide levels up to par. BUT, the pool was still cloudy/hazy. I then changed the sand in the filter and filtered another week (24/7) and the pool is still hazy. I went to my pool gal (who's very knowledgeable) and she sold me a " Filter Aid." basically it's a dry powder added with water to make a "slurry" and poured into the skimmer. I was told that within 8-12 hours the filter pressure will rise by 10 points, my pool will be crystal clear and at that time, I should backwash. I filtered for a week straight and the pressure never rose more than a point. I backwashed anyway and the backwashed water cleared within a few seconds. But, still the water was cloudy. I decided to take the cap off the filter and found this "slurried" solution I poured in a week earlier had hardened into a 3 inch thick shell. So I cleaned out the filter and changed the sand AGAIN. I ran it another day or two and still no clearing up. I poured into the skimmer, a flocculant (dry granules) and the water got worse. I tried it again with the flocculant the next day and now I can't see the bottom of the pool. What can you tell me Alan? I'm ready for the nut house. Again, I NEVER had problems like this before. Thanx much. You told me a lot but there are gaps. You cannot use non-chlorine granular shock with biguanide, as it will decompose the biguanide and will not solve the problem. Only hydrogen peroxide can be used as a shock treatment. The filter aid should not have caused that to happen. It is either contains some other additives or there is something that coagulated it in your pool. Biguanide can do that! But, why would they recommend the product, if you are using biguanide? Freshly filled sand filter can be very inefficient and the dead algae and debris might be passing right thru. Ordinarily, I would suggest adding some DE to the skimmer. But DE will be coagulated by the biguanide. Make sure that the biguanide level is OK. Add some more hydrogen peroxide. LaMotte makes a test strip that can test for peroxide - maybe the dealer has the item. There is a possibility that the floc - if it was aluminum sulfate - got into the pool. This being the case, it could contribute to the cloudiness, until it is completely removed. Raise the pH to 8.0 and shut off the filter. The next morning vacuum the bottom to waste. This should remove all of the flock and may even give you clear water. Now for the bad part. It is not unheard of for long time biguanide users to develop problems with white water mold. This may be part of your problem. However, it is difficult to say this with complete certainty. The treatment for this problem is the complete destruction of all the biguanide and the establishment of a 1-3 PPM level of Free Chlorine. At this point your pool is on chlorine and it should destroy the water mold. Switching back may bring a return of this problem. It takes about 4 pounds of non-chlorine shock or 4 gallons of liquid chlorine per 5,000 gallons, to destroy the biguanide. Depending on the condition of the water, even more could be required. Thereafter, boost the Free Chlorine to about 5-10 PPM. The decomposing biguanide will consume the chlorine and the pool will go through a green-brown stage. There are lots of alternatives that minimize the use of chlorine and you might look into them: UV Sanitizers, Solar-Powered Dual Ion Mineralizers, Ozonators and Salt Chlorine Generators. Some can be used together, for even better results. I hope that this information proves helpful. Thanx much Alan. I just returned from my pool gal and she states that the problem is water mold. My shock level was low even though I poured it 4 days ago. I'll ask you though Alan, IS THIS the time to forget about biguanide and just go with chlorine from this point forward? After reading your email, I see that this may not be my last battle with water mold. Also, the filter aids and flocculants I used were both biguanide related products, assumingly safe for biguanide pools. I will shut everything down and see what the water looks like tomorrow. Alan, thanks so much for your advise. Tomorrow may bring clear water. BUT, the mold will still be there, lurking and ready to start trouble all over again. This is a biguanide-resistant organism and once it appears, I think that a switch to another sanitizer is the best thing to do. Sooner or later, you will switch. There are lots of alternatives to ordinary chlorine to choose from: UV Sanitizers, Solar-Powered Mineralizers, Ozonators and Salt Chlorine Generators. Many can be used together, for even better results. I hope that is clears up for you. Have a good summer. How to convert, reduce costs and eliminate mold issues. Use a second sanitizer, for added backup protection. Use an Ultraviolet Sterilizer to eliminate resistant microorganisms. The Pool Circulator provides better circulation and improves sanitation and filtration. Get better water clarity, using Nano-Titanium Technology. You answered some questions right after we first got our pool two years ago about balancing the water and what's important. I have read about zeolite on your web site. This is our current chemistry and the water is not as sparkly or clear as desired. We can easily see the bottom but its just not as clear as before. Our pool is 50,000 gallons -its big. I do not want to use floc to try and clear the water, its a real pain to use and hard to vacuum all of it out. The pool chemistry tested OK. Would a zeolite sand replacement media work in a biguanide pool or would it tend to clog? The company we got our pool from also sells chemicals for both biguanide, chlorine and salt generators. When I asked about the white mold possibility, that is mentioned on your website, they said that if we get it there is a treatment that will get rid of it. They also said they are recommending that instead of putting all 5 gallons of shock in at one time per month, as recommended, that its better to only put in 1.25 gallons a week. Would zeolite help clear the pool and make it sparkle or should I get some clarifier or use the floc, which I hate? What would you recommend? Sincerely. You need a wake up call. You should switch from biguanide to another sanitizer now! Do it before you waste hundreds of dollars and part of the pool season. The dealer does not want you to convert and seems to be making if difficult and dragging it out. This 1.25 gallons a week is utter nonsense and it not recommended by the principal manufacturer, so far as I am aware. It is bad chemistry! It will reduce your biguanide level, leaving you exposed to even more problems, and there will be zero chlorine. It is almost a punishment for converting! The 5 gallons figure is a drop in the bucket, for a pool of your size. You will probably require 40 gallons! Sooner or later you will switch, as mold problems seem to be almost inevitable. Switching for a while, is only good for the dealer, because the problem is caused by biguanide-resistant microorganism and will return. Conversion is simple. Add 4 gallons of liquid chlorine for every 5,000 gallons of water. The chlorine will react with the biguanide and start to decompose it. As this happens, the pool will go through cloudy and discolored states. This is normal. Periodically test the FREE CHLORINE level! You have to repeat this dosage. Only after enough chlorine has been added to register a stable FREE CHLORINE level, will enough have been added so as to destroy the biguanide, algae and debris. From this point on you should be able to maintain the chlorine level with normal product additions. During this time, adjust the pH, total alkalinity and add chlorine stabilizer. I would not count on zeolite solving the mold problem. However, it works really well with a salt chlorine generator, chlorine or bromine. Think about what you are spending on biguanide and related problems and compare that to a salt chlorine generator. If you are interested in maintaining the pool with chlorine and at the same time getting better water quality with less effort, you might look into a salt chlorine generator. It will give you control and results, that biguanide could not. I hope that this information is helpful. ► Wild Shade Of Pool Water Colors? I was advised by my pool dealer to let my biguanide level drop, slowly begin treating the pool with chlorine via tablets in the skimmers, and finally use a chlorine shock to "eat up" the biguanide. I did as told and all went well until I added the shock. My water turned a wild shade of green/yellow/brown. A day later it is now a murky sea foam green color. I think I should have used a non chlorine shock from what I have now researched via the internet. My question is what do I do now that I'm in this mess? Help Please? Thanks. The preferred method to destroy all of the biguanide, according to a leading biguanide manufacturer, is to add 4 pounds of non- chlorine shock per 5,000 gallons of water. Chlorine will accomplish much the same end result. It is normal for the water to undergo a color range, as you have described. All of the biguanide will not be eliminated from the water until you are able to maintain a stable Free Chlorine level and the water clears up. At this point, I would add 2 pounds of non-chlorine shock for each 5,000 gallons of water. How much shock will be required will depend upon the biguanide concentration and the condition of the pool water. Algae filled pools will require much more shock! I believe that if you are going to make a switch to chlorine, the sooner and faster you add the shock - the better. There's no point in prolonging a period of discolored water and inadequate sanitation. The color will return to normal, as soon as all of the biguanide has been decomposed by the shock treatment. Afterwards, resume normal chlorination. The addition of a Nano-Stick Clarifier will help you get optimum water clarity sooner and with fewer chemicals and lasts for 4-6 months. I hope that I have been helpful. ► Happy Except For The Costs? Just happened upon your site and read the questions in the biguanide section. We have used biguanide for about 15 years. We have been nothing but pleased with all aspects of it except the cost. Our water stays crystal clear, no horrible chlorine smell, no worry about the kids tracking and leaving bleach spots in the house, etc, etc. And all of the questions I read are about people having problems and switching back to chlorine. Are we the only people pleased with Biguanide products or are the only ones writing to you those that have problems? My actual question is related to our one complaint of the biguanide products - the cost. I notice as you are talking about biguanide shock you are always saying to shock a biguanide pool to use hydrogen peroxide. Is that the ingredient in the biguanide shock (oxidizer)? What I am really asking is - are there any other compatible, cheaper shocks that can be used with Biguanide, and I am assuming that you can't just add regular hydrogen peroxide? The other question I have is just wanting you to affirm that we have been correct in one thing we have been using with the biguanide for years - muriatic acid. We fill the pool with our well water which is very hard and our total alkalinity is always off the chart in the beginning of the year. We gradually reduce it with several gallons of muriatic acid until it is in range. This is another reason we prefer the Biguanide products, because they work equally well until we get the alkalinity under control which usually takes a few weeks, whereas chlorine is not nearly as effective until that alkalinity is under control. Thanks for reading this and answering/commenting to help us out. People write because they are having problems or need information. Happy campers are less apt to write. 15 years on biguanide is a long time. If you don't mind the cost, you have no reason to switch. However, if you start to experience resistant mold and clarity issues, switching will become necessary. There is no set timetable. Some people have problems, within the first year or two. Your letter is really an exception to the rule, so I'll probably add it to the archives for some balance. The only oxidizer or shock that you can used is hydrogen peroxide. The drug store variety is far less concentrated and not cost effective. Total alkalinity is usually not a problem. It is the pH that is always more important and high TA can make pH adjustments require more chemicals. Alternative sanitizers, such as UV Sterilizers, Solar-Powered Dual Ion Purifiers/Mineralizers, Ozonators and Salt Chlorine Generators, are available that provide quality water and pleasant conditions. I hope that I have been helpful. Can I use a zeolite sand replacement media in my biguanide pool? The issue concerns biguanide, in general. It has been found that the polymer gel that is created, during shocking, interferes with filtration. This has long been a problem with sand and it is almost impossible to use DE or cartridge. However, this situation can be handled by cleaning the media every 30 to 45 days with a quality filter cleaner. The cleaners, in the biguanide product lines, work fine. It is a matter of regular maintenance with biguanide pools. Filters, with zeolites, have been running on biguanide pools for several years. As long as the media is cleaned on a regular basis, the results should be good. I hope that this help clarify things. We are at the end of our rope! We have owned our in-ground 20 x 40, 35,000 gal. pool for 14 years, and have never had problems like we are having this year. The filter system is literally going to 30 with in a few minutes after we clean it. I have read the archived info. regarding this problem and have done everything suggested from blowing the lines with an air compressor, to cleaning the "fingers" in the filter itself with an acid wash. We have changed the DE., checked the pump and so on. We use biguanide and have not had a problem before with that product. However, after reading on another web site that biguanide can gum up the filter, I was wondering if this could be the problem. The only thing we can think of that could be causing this problem, is about 3 weeks ago, our pool supplier was out of our normal algaecide. They recommended instead to use a product with the word "copper" in it. Could combining this product with biguanide be the cause of our frustrations? And if so, what can we do about it. Also, the water feels different. I'm not sure if I can describe it, but it feels kind of oily and sticky at the same time. Any suggestions? Thanks for doing what you do! The reason that you could not find the answer on this website, was that it was never addressed before - at least not by me! It is well known that biguanide interferes with the performance of DE filter, by coagulating the filter media. It should have been equally well known that copper algaecides cannot be used with biguanide. I suspect what has happened is the polymeric biguanide has cross-linked with the divalent copper. This results in a larger molecule with different characteristics, apart from the anti-bacterial performance. Clogging of the filter might easily be the result. While it seems highly likely that this is what happened, the solution is not something that I can be 100% sure about. I would add a double dose of a metal treatment and give it a day or two. If there is no improvement, I would add sufficient chlorine to destroy all of the biguanide and start from scratch. You will need about 4 pounds or gallons of chlorine shock, for every 10,000 gallons. More may be required. Once a stable free chlorine level is detected and the water is clear, you are free to resume normal operations. To resume biguanide sanitizing, you will have to eliminate any residual chlorine. Otherwise, you could remain on chlorine. You might want to discuss this with the biguanide manufacturer. Please let me know how it turns out. Good luck. I hope you remember us. We had the problem with the Copper algaecide being added to our biguanide-maintained pool. We followed your advice to add the metal treatment product. We also went back to the pool supplier and they gave us a very nice supply of chemicals to make up for their mistake. It was amazing when we put in the first 4 quarts of the product. Within about 5 minutes, the filter gauge went down to 15. We have since then added a quart a day, because the copper is still gathering in the skimmer basket. The pool is extremely clear and the water again feels great. Thank you for your knowledge and I will definitely recommend you to anyone with a problem. A happy ending! Glad to see that the pool dealer accepted responsibility. Thanks for the feedback. ► Damage To Plastic Components? It recently came to my attention that biguanide (or any biguanide based sanitizer) attacks clear plastics, including Lexan. As I understand, over a short period of exposure (e.g. months), the component will typically fail. The example that was given to me was the clear plastic top that is on most pool pumps. Do you have any insight into this issue? Is this true? Any insight/direction you can give me to get more information on this issue would be appreciated. Best regards. This topic has not come for years. There was an association between biguanide usage and a deterioration of polycarbonate plastic components. Manufacturers that were affected by this problem seem to have long since made changes to avoid this breakdown. I am not sure that all products on the market are problem-free, but it is a solvable problem. I would hazard a guess that current products from leading manufacturers are suitable for use in biguanide pools. I hope that I have been of some help. Currently my pool is being maintained on chlorine. I'm thinking of switching to biguanide. I heard that there is no chlorine smell. Is there anything I have to do before switching over? Thank you. In order to start using biguanide, it is necessary to eliminate all of the chlorine in your pool. For that purpose, the biguanide manufacturer provides a chlorine neutralizer product. Copper and silver algaecides might, also, present a problem. If you have ever used either product, I suggest that you bring in a water sample for analysis. The dealer should be able to determine, if any additional steps, are required. Good luck with your decision. ► Need To Replace Sand For Conversion? I will be changing from biguanide to saltwater this spring, due to major problems last summer. My question is will I need to replace my filter sand after conversion? It was changed a few years ago. The pool is an above ground type. Thanks. Switching from biguanide was a good move. By now it has formed a gooey, snot in the filter. It can be eliminated, by adding lots of chlorine. Or you could replace the sand, something that should be done every 3-5 years. The switch to a salt chlorine generator will provide better control over the water quality and will reduce chemical costs. The Model SR can be used in pools up to 20,000 gallons and requires no installation. Add the required amount of salt, plug into a GFI protected outlet and you'll be producing chlorine. I hope that you will find this information helpful. ► Is Draining To Convert Necessary? Can I use a cartridge filter pump with a 16’ X 24’ above ground pool utilizing a biguanide system? We want to convert to a chlorine system and we are draining the pool, but I want to make sure that we have the right type of pump for this system. Thanks! You don't have to drain the pool. Draining could result in the liner shrinking or structural damage. Conversion is simple. Add 4 gallons of liquid chlorine for every 10,000 gallons of water. The chlorine will react with the biguanide and start to decompose it. As this happens the pool will go through cloudy and discolored states. This is normal. Periodically test the FREE CHLORINE level! You have to repeat this dosage. Only after enough chlorine has been added to register a stable FREE CHLORINE level, will enough have been added so as to destroy the biguanide, algae and debris. From this point on you should be able to maintain the chlorine level with normal product additions. During this time, adjust the pH, total alkalinity and add chlorine stabilizer. If you are interested in maintaining the pool with chlorine and at the same time getting better water quality with less effort, you might look into a salt chlorine generator. It will give you everything that biguanide could not. No more chlorine to buy, handle or store! Enjoy the season and I hope that this information proves helpful. I noticed you keep referring to "automatic pool cleaners." We have one that is water powered. It has a net attached to a hose and water jets propel debris into the net. Is this the same thing? Is this good enough to keep circulation going on the bottom of our above ground pool? We have been having an algae problem lately and I was wondering if we should use the cleaner more often? Also, we have been using biguanide products in our pool. Is it safe to use chlorine instead? The biguanide just doesn't seem to be doing the trick, but I don't want anything we put in the pool to harm the liner. Thanks for your help. The automatic pool cleaner that you have is fine. It will remove the coarser debris and stir up the silt for removal by filtration. It will help improve the circulation across the bottom and that can aid in algae control. However, a robotic pool cleaner would have been a better choice, as it does more and is independent of the pool's pump and filter. In order to switch from biguanide to chlorine, you will have to add enough non-chlorine shock or liquid chlorine to completely destroy all of the biguanide and establish a level of Free Chlorine. Start with 4 pounds or gallons per 5,000 gallons of pool water. The pool will go through a cloudy green to brown stage, but it will clear up, once a Free Chlorine level has been established. Thereafter, maintain normal chlorination. I hope that I have been helpful. Enjoy the summer. I have been using biguanide for the past several years. The results have been good, but I would like to reduce my pool expenses, for the upcoming pool season. I will be opening the pool in about 6 weeks and I would to convert to a automatic chlorinator. What do I need to do to keep it simple and inexpensive? I have a cartridge filter. Thanks. ► Long Road To A Successful Conversion? Alan, I want to thank you for all of your help. Please feel free to let those people who are having Biguanide problems, know my story. I only wish that I had listened to you last year and switched to chlorine then. We figured that for the amount of money we have spent on biguanide products, especially since the water mold and pink slime arrived, we could have purchased a quality, salt chlorine generator. One thing I think should be emphasized on your site, for those who need to change over from Biguanide to chlorine: with a large pool (50,000 gallons), it is a long and timely process and will not happen overnight. We started with a biguanide level of 20. But in the end, it took 30 gallons of liquid chlorine shock. 40 pounds of non chlorine shock, and approximately 80 pounds of Calcium Hypo chlorite. We used this because the pool company gave it to us. Finally after 3 weeks, I added the last dose of chlorine shock and was able to obtain a 8.5 PPM free chlorine level. Then, it settled back to 2.0 overnight and is holding between 1.8 and 2.5 and am now adjusting the automatic chlorine feeder. Maybe in the future, we can afford a salt chlorine generator. I want to thank you, for all of your help, and constantly refer people to your site. After the last super chlorination the water mold is, for all intents and purposes, gone. The pink slime disappeared, early in the process. The water is as clear and sparkly as the first day we filled it up 3 seasons ago. Well worth the time and cost to convert to chlorine. Once again, I cannot thank you enough. For some people, biguanide works to their liking. For others, it can be an expensive nightmare. The problem is in not recognizing that it is time to switch, as the problem mold and slime have become resistant to the biguanide. The chlorine added not only had to decompose the biguanide, but had to destroy the slime and mold, as well. I am glad it had a happy ending and a Salt Chlorine Generator would be a logical next step. Thanks for the feedback.